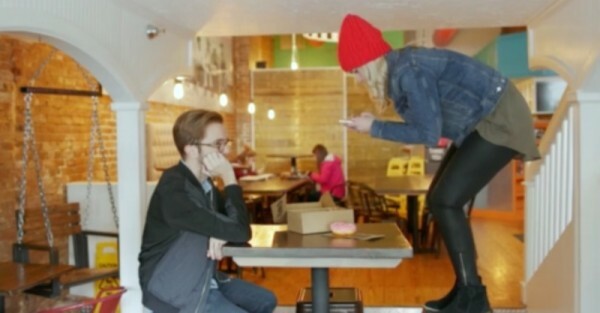 Behind every great Instagram photo there is an Instagram Husband. This is their story. And it is hilarious! Remember a time when people used to eat their food instead of just photographing it and posting the pics to Instagram? Instagram Husbands do. And they are lamenting about the rise of social media in a mockumentary-style video and website that outlines the joys of living in a world obsessed with selfies. If you’ve ever been in a room with someone who loves Instagram, then you know the struggles all too well. You cannot take a sip of coffee until a photo has been posted. You cannot walk past a brick wall without getting the perfect shot. You cannot ignore a beautiful leaf on the ground in the middle of the road without snapping a ‘foot’ shot with said leaf. This video has it all. And so much more. The Instagram Husband video was only uploaded last week but the concept of the Instagram Husband – the “human selfie stick” who takes photos of their girlfriends, wives, food, shoes and the rest to post on Instagram – actually started with a website known as Instagram Husbands. The website hilariously parodies ways to “receive help” and “symptoms” to be aware of and encourages readers to share their own Instagram Husband moments. The husbands behind the camera, the website and the concept of Instagram Husbands are a group of men known as The Mystery Hour. The team produces a late-night TV show that airs on a FOX affiliate in America and originally wrote the video as a way to promote their talk show. The boys have certainly struck a chord with a society obsessed with social media. We have a good feeling about these guys – can’t wait to see what they come up with in 2016!